Paris last week felt much more sombre than on other visits. It was cold, and the skies were dark and cloudy, as if reflecting the grief and sadness caused by the events earlier in the month. Heightened security was to be seen and felt everywhere... armed guards and police patroled the streets, and FSH and many other stores had extra security, checking everyone's bags upon entering. 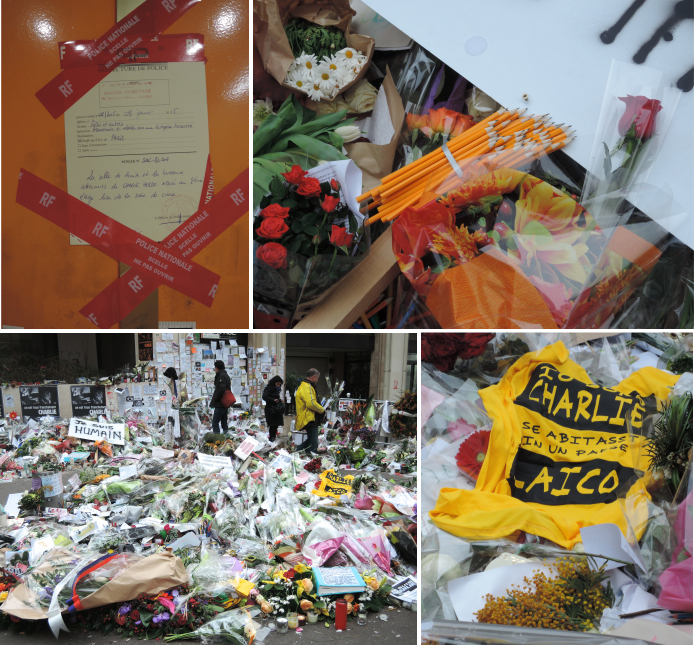 'Je suis Charlie' posters and banners were to be seen in countless windows and on walls showing their solidarity with the victims, and tributes in the form of flowers, pens, letters and candles were left where the events took place. FSH's windows have changed since my last visit, and the face of the building was lit in a soft glow. A post with pictures of the displays will follow soon. Many fashion fairs and salons took place that week, and while sourcing materials and talking to manufacturers, I came across 'Pilus' and asked them if they still make the lovely faux fur ankle boot slippers I wore in a recent blog post, telling them that the ladies in Le Salon could not find them anywhere, and that Google searches resulted in "plus sized slippers". They were thrilled, but désolée for having none left (mine were from AW2013). The new collection is not the same, but I found some beautiful items from other small manufactures which will be joining the collection in the months to come. 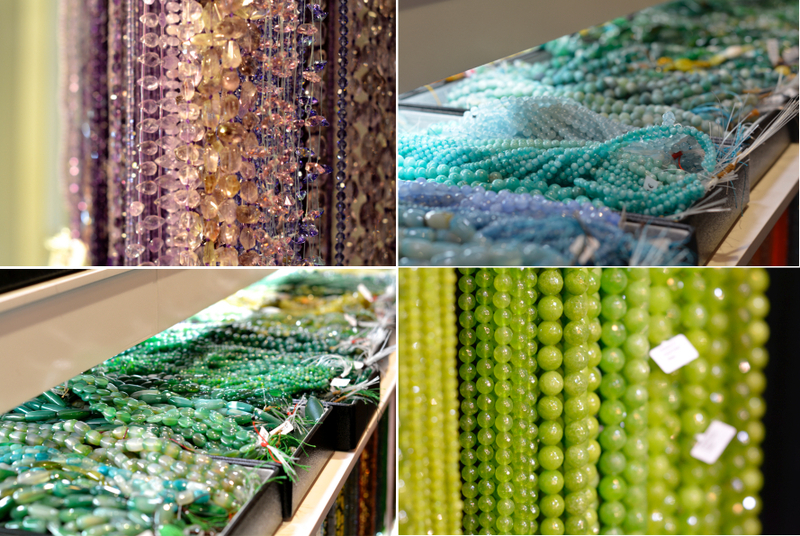 The jewellery suppliers section of another show transformed the exhibition hall into Aladdin's cave... strands and strands of semi-precious stones, beads, pearls and crystals in every color, shape and size imaginable were hanging from pegs and bars or were piled into boxes. The SS2015 scarf booklets are out... I only wish I had more than just four to give away. To enter the mini-giveaway nothing other is required than to enter your email address into the form below. But if you feel like it, your support in the form of a Facebook like, or a subscription to my Pinterest boards, YouTube channel or email updates is always much appreciated. Your email address will not be publicly displayed, or forwarded to third parties. You can choose any username/nick/ID to enter the giveaway. The winners will be randomly chosen, notified and announced on Tuesday February 3. One entry per person, open to readers worldwide. The booklets will be sent to the winners free of shipping charges within 24 hours of receiving a delivery address. I am sorry for the shortness of this post, but it's been hectic since I got back and I'm still battling with the flu I caught on my return journey. Pictures of the current FSH windows next, hopefully in a few days. Thank you Mai Tai for such a gentle, respectful post. Darling MT, so very sorry to hear that you are struggling with the flu:-( Don't concern yourself with us! We will always be here when you are feeling better; hopefully,sooner rather than later! I am sure seeing Paris after the recent events left a chill that not even the pretty baubles could help shake! How sweet it was of you to inquire about the slippers<3 I am certain that I am not the only one looking forward to seeing the new additions to the Collection...all in good time! I neglected to add a big THANK YOU for getting this post up and out...flu and all! You're so right, Trudye. I would so love to get a print of the lion, frame him and hang him in a place of honor. MT has such a wonderful eye . . . with everything. She's a true artist in every sense of the word. This chickie bird is doing great,my friend,merci! Yes, that lion pic is stunning and all encompassing...love it,too! I love how it stands out amongst the misty fog...a beacon of strength! Your champagne cocktail sounds delish! NOLA is mid way for the two of us...let's get together and sample a few champagne cocktails! How are your little feral kittens, LBD and her friend...forgot the name? Hope they are staying toasty warm in the cold! Stay warm...and keep sending cocktail recipes! Meeting up in New Orleans would be fun, wouldn't it - as long as it isn't in summer. Summer heat and humidity and New Orleans are definitely not a good mix. especially if you want to sip a couple of champagne cocktails! LBD and Louie are faring well, thanks to my neighbor's custom made cat "igloos," constructed of purr pads and the like (including warming discs she puts in their beds twice a night), but bad Louie keeps ripping his apart. Cats are not the most grateful beings on the face of this earth! But, thanks for asking about them. I'll tell the sweeties that you inquired. And, of course, I got the name of that delicious champagne cocktail wrong. It's a St. Charles Streetcar - duh. Charleston is another charming southern city all together. I think my brain might be frozen! NOLA in the summer is waaay too hot and sultry for me too,Jerrine! I do love taking that St. Charles streetcar thru the garden district when the azaleas are in bloom! Beautiful and a good way to stay cool on a hot day! Yes, hope our gal MT, is feeling better and starting to get some pep in her step! Sending well wishes, and hoping you're feeling better very soon! The last photo is exquisite! Thanks so much, dear NN! Oui Paris est triste depuis se terrible jours de janvier . Bientôt de très belles choses se profilent. Ma très chère MAITAI je te souhaite de te rétablir bien vite . So sorry to learn you're under the weather w/ the flu--wishing you lots of rest, lots of water-drinking and lots of TLC from your loved ones, many of whom (me) are sending you healing vibes...brain waves do work!!! Your poignant photo of the lion, standing atop the 'hill', in the cold austere sky says so much; thank you for capturing the mood in an instant. I do hope that Paris, France and the rest of the world can be that lion, the king of the world, in the battle against heinous crimes against mankind. Godspeed in beating that flu, and getting back to creating beautiful objects of art for the MaiTai Colleciton. Lovely, sammie. We seem to feel pretty much the same about that lion as a symbol of strength and courage. Thx for your thoughts, and wishing you a good first week of February. (and a very belated happy new year to you; I've been MIA from the blog, but Le Salon never far from my thoughts). That's nice to hear, sammie, as you're in our thoughts, too, of course. A happy 2015 to you, as well. PS - In regard to staying warm, it's 25 here this morning, but considering the temperatures elsewhere, I suppose I should be thankful for that 25! Thank you for this post, and for not letting us forget this tragedy. As a French friend of mine said, "This is our 9/11." Pooh to the flu! I hope that you're resting and that you'll recover quickly! These photos capture the melancholy mood of Paris in it's time of grief. Your photos are hauntingly beautiful, however. The first picture is pure art, with the image of the Tour Eiffel shrouded in the mist. It's a powerful image. Have ben wondering if you are making any progress? Fingers,toes crossed that you are! But, tincture of time is usually the order here! I am sure your fine hubs is keeping you stocked in your favorite bubbly...so it is fun trying! Trudye, let's go visit Haverfordgal and take her some "medicine" - St. Charles Streetcar champagne cocktails for everyone. I love your expression - "tincture of time." I will try and remember that one. My kind of medicine,Jerrine! But, let's wait until those rolling blizzards are on their way out to make a house call! We don't need to slip on the ice while 'under the influence'! Then Haverfordgal would really have her hands full! She'd have to order in a LOT more champagne! Bet we'd have fun, though. Thank you for the good wishes, dearest haverfordgal! Hope you are better yourself! Will join J and T on the house call (following them around everywhere these days), hope the ice bucket is ready! I've enjoyed following your blog for years. I'm a lover of all things Hermes too! Hope you get well soon. Sorry to hear that you are struggling with the flu!! I do really appreciate that even feeling poorly you have time for us!!!! Paris looks sad and grey after the horrible events.. but as one of the ladies of the Salon said we must be brave!!! It will be an easy visit, just keeping with Hermès theme we’ll be flâneurs.. and your carnet d’adresses will help us to find nice places for nurturing our soul... and of course a visit to FSH will be “ de rigueur”..
Just take care.. We’ll be all here waiting for you..
Poor Paris. I still feel so badly for all that was endured there recently. For some inexplicable and maybe silly reason, it always feels worse when a city of such beauty, elegance and culture is senselessly attacked and its citizens killed and terrified. I love your very evocative photo of that stone lion, seeming to stand guard protectively over Paris and also voicing his displeasure over what he's seen. May all the people of Paris share his lion heart at this point. On a lighter note, I did want to jump right into that "Aladdin's cave" and wallow around in all that goodness. I can't wait to see what you come up with in the future after this all this inspiration. And new goodies coming soon? Oh, boy . . . So sorry that you came down with the flu and are still battling it. It's a mean old bugger, and it doesn't like to let go, so rest as much as you can and don't worry about us. We aren't going anywhere are we ladies? Heck no, we won't go! Simone and Haverfordgal, that's the spirit. H, how are you feeling? Any progress to report, and is there any champagne left? I sincerely hope that you're improving day by day and that the champagne supply is endless. Speaking of champagne, I had the most wonderful champagne cocktail in New Orleans last winter. It's 1 oz. of pear vodka, 1/4 oz. of Sainte-Germaine liqueur (made from elderflowers), and then you fill up the flute with champagne and float a thin slice of pear peel on top. It's delicious and packs quite a punch. If I remember correctly, they call it a Charleston Streetcar in NOLA. Yum! That champagne cocktail sounds heavenly. I've never heard of pear vodka but they have all kinds of flavors now, don't they? As far as this blog is concerned, I'm not going anywhere either! After one or two of those champers cocktails, I will be incapable of movement in any case. Dear Haverfordgal, how are you doing? I hope you are feeling much better. I hadn't either, but I guess its now available in every flavor but chocolate! I thought the Sainte-Germaine liqueur would be difficult to find, so I spent several hours tracking it down in New Orleans and then carried the very heavy (but oh-so-beautiful Art Nouveau-inspired) bottle all over the city for several hours and brought it home in my suitcase, only to find that it's readily available here. Oh, well . . .
And, yes, after a couple of these babies, you won't be doing much moving. I think that's why I prefer to sip one in bed. You can simply pass out and not get hurt. Ha...just set up the bar on your bedside table and you are good to go,darling Jerrine! Or perhaps you already have? Lol! Yes a good weekend to all and hope the sun is shining in everyone's corner! Our village idiot does not understand the global village. Healing prayers for French citizens everywhere. Healing thoughts and prayers for all victims of attacks. Speedy recovery, Mai Tai, and thank you for your haunting pictures of Paris. Thanks so much, dear Annie. Just started following you on Pinterest. I love your blog! Thank you, and a very warm welcome to my boards! Thank you so much for taking the time to make this post for us. You are truly kind and generous <3. As previously said by some of the ladies, we will all be here waiting for you, so please take all the time you need to rest and recover from the flu. I also find the first photograph very impressive, the right choice to describe the dark and sad atmosphere surroundng the City of Light right now. Let's hope this horrendous act will never happen again. On a happier note and like Jerrine, I am ready to 'jump into Aladdin's Cave' and do look forward to the upcoming members of the Mai Tai family. Thank you for this post it is good to show what goes on once the news reports stop, but life goes on and Paris will bounce back of that I am sure, look at London and New York. Scarf, so sorry. You're had a bad time of it. Stay on your feet and no more falling, okay. Oh, you poor thing! Please take good care of yourself. I'm sending hugs your way. Take your time to recover MaiTai. I am so sad for Paris. :-) Get well soon, dear MaiTai! Oh what a sensitive and right post for what's happened in Paris and the sadness of all the people in France. Particularly in Paris of course.difficult to show beautiful things in this days right now, but Charlie would like to continue and you made it, as usual with your great sence of refined and delicate heart. Flu this year is everywhere take care dear Mai Tai. P.S. I hope that comment will leave because still in the islands and will stay 5 days more because of the Geneva ' awfull weather". So glad to hear you again. Best wishes for a speedy recovery, dear MaiTai. Take good care of your precious self. As with others here, the photo of the stone lion I find so compelling. It's on my computer desktop and looking at it brings strength as I face an unwelcome milestone of life which will occur tomorrow. There is a timeless quality to that photo, a sense of one's little problems merging with others down the ages, all part of the human story. What I endure, others have endured. As others overcame, I shall overcome. We are all connected. That brings me great comfort. Thank you so much for your unique blog. And oh! The beautiful candy-colored baubles - how delightful! I am so glad to be female! Sending out best wishes and congrats for your milestone on the horizon! May you celebrate everything that you are and everything you have walked thru to get there! Like the lion,may you walk in great strength...let us hear you roar! Trudye said it so well, Fifi, and I can't really add to perfection except to say roar and roar loudly! And, of course, celebrate, too, and maybe go pick out that new H. scarf. MT, I hope today finds you feeling a bit better and stronger after your bout with the nasty flu. Just want to thank you again for the lovely post, which hit just the right note and, of course, for the beautiful, artistic and sensitive photos. Thank you, dearest Trudye and Jerrine, for your inspiring words and your kindness! Trudye, your post came before the "event" so I printed it out and brought it with me, along with other notes of encouragement from friends. I felt surrounded by love and support. Demure outside, I was roaring inside! Soon I will truly feel like celebrating and what better way than to pick out a new H scarf! "Thanks ever so!" (as Lorelei Lee would have said...) Dear MaiTai, hope this post finds you completely recovered from the nasties. Oh, Fifi, I am so glad you felt all of the love and support surrounding you...truly I am<3 There is no better feeling in the world than to know you are not alone! Prayers to you for continued strength and good results. Happy for the day when your roar on into to H to make your purchase! Hope that is soon! Living in Canada I like very much your blog and I read it very often. Unfortunately, I dont understand most of your abrevations! !